Sick of being told when you can take a bathroom break? Is your day job bringing you down? Do you wish you could join the ranks of freelance writers, but just don't believe it's possible? Maybe you're retired, but you hate the idea of being a Wal-Mart greeter. Maybe you're a stay-at-home mom who wants to make some cash while the kids are at school. Or maybe you've just always had a knack for writing and wonder if you could do it for a living. If you've ever dreamed of starting a career as a freelance writer, there's no better time than now. But how do you start? Isn't it scary to take that leap? Can you really make money as a writer? The short answer is yes. But where do you find clients? Do you have to have a niche? What is it really going to take to make this new career path work? You could take the hard road and figure things out along the way, wasting a lot of time in the process, while you scramble to get all your ducks in a row. Or you could hire a coach so you know exactly what to do to start your writing career on the right foot...but only if you have thousands of dollars to spend. Is there a third option that saves you time and money in your quest to write for a living? Write well? Paid well. Yes! 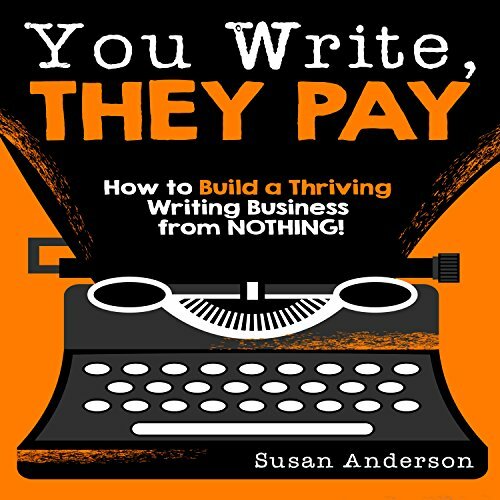 Susan Anderson's You Write, They Pay gives freelance writers (and wannabe freelance writers) the tools to get their writing careers going and the money rolling in. You'll learn: How to approach projects when you don't think you know anything about the topic. How to get paid. How to get good clients (who pay you well)! How to find work when you're just starting out. Learn how to make your writing dreams a reality today.